Success with video marketing in 2018 hit a new high - with more and more companies (including small to midsize) realizing the power of putting their team in front of the camera. Despite all of this, however, a lot of companies still think they ‘don’t have what it takes’ to be successful with video. 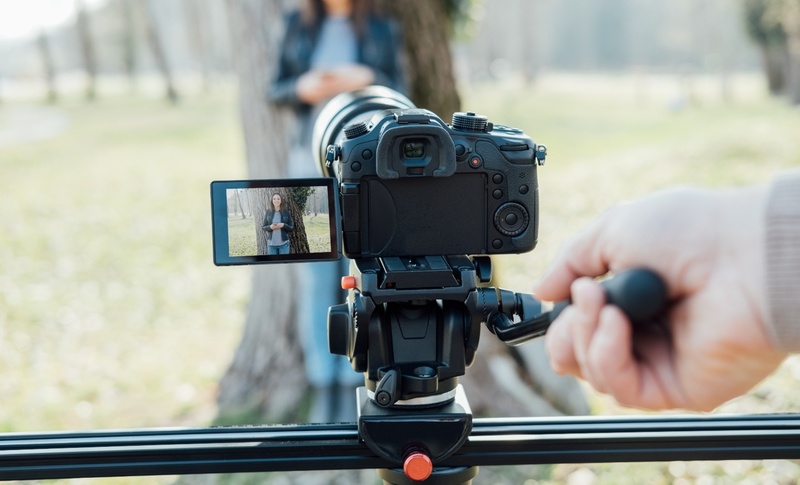 If you’ve ever thought: “it will take a lot of time,” “my team won’t be good in front of the camera,” or “we have other priorities, like closing new deals, before testing out video,” we’ve compiled a list of video marketing statistics which will prove why video needs to be an essential part of your marketing strategy (while you’re starting to think about 2019). Whether you’re doing video currently and want to take it up a notch, or new to including video in your strategy, these stats are meant to guide your efforts. Note: Unless otherwise credited, the majority of the stats in this article were collected and written about by our friends at Vidyard in their 2018 Video in Business Benchmark Report. If you’d like to get their full report and research, follow this link. 1. Cisco has projected that more than 80% of all Internet traffic will be video by 2021. Why it’s relevant: Users are using video more - so they’ll expect to see it on every site they visit, including yours! Video helps people stay on sites longer and stay more engaged. So use it! Why it’s relevant: Similar to the stat above, video is everywhere. There is so much content produced and published that users are getting used to interacting with a wider range of brands (other than just YouTube stars) with video. Your brand needs to be one of them. 3. While larger companies do produce more videos on average, there is no direct correlation between company size and number of videos published. In fact, companies with less than $10 million in revenue are holding their own (and even outperforming!) much larger organizations when it comes to video production—which is a noticeable change from last year’s data. Why it’s relevant: You can create video even on a budget! Smaller companies are catching up to larger companies when it comes to video production because there’s less red tape - but this also proves two points. First, that small companies CAN create a lot of content - and second, large companies need to rethink their video strategy. They should have more resources to create quality video content. 4. 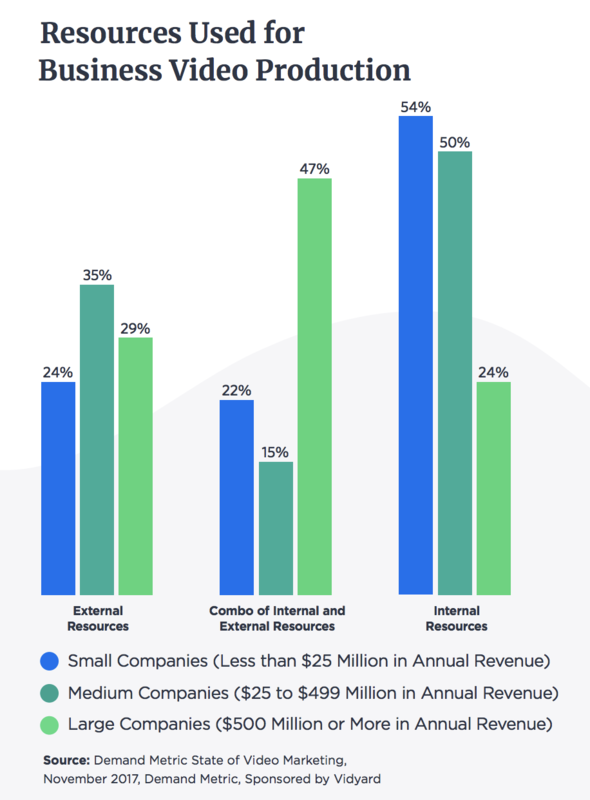 Unsurprisingly, small businesses use the fewest external resources for video marketing, with only 24% reporting that they relied exclusively on agencies, contract employees, or freelancers. Why it’s relevant: Again, you don’t need a massive budget or outside help to produce quality content. Find out what you can afford and work from there. 5. Businesses in high tech and professional services industries are publishing the most new videos on a monthly basis. Why it’s relevant: If you’re in high tech or professional services, pay attention. Your competitors are creating video content, so you need to create better, more helpful content. Even If you’re not in these industries, take the chance to stand out. 6. Businesses in high tech and professional services tend to keep their content shorter, with a high percentage of videos under 120 seconds in length. This trend towards shorter content seems to be consistent across the board, though professional services, media entertainment & publishing, and retail also regularly publish longer-form content over 20 minutes in length. Why it’s relevant: Videos don’t need to be long to be successful - they just need to be helpful towards your user. 7. Businesses are increasing their investments in both in-house and outsourced video content to help serve the growing demand for video throughout the customer lifecycle. Why it’s relevant: As more businesses are proving, it’s important to hire someone that has experience with video to launch your company in the right direction. 8. According to Forbes, 90% of customers say video helps them make buying decisions and 64% of customers say that seeing a video makes them more likely to buy. Why it’s relevant: The proof is with the customers! Video consumption has been linked to increased sales. Take note and put some thought into where video can best be used in your sales process and buying journey. Why it’s relevant: Who doesn’t want more qualified leads? The increase in quality comes from the education they were given through video as a medium. Customers are able to gain trust and educate themselves with video in ways that can’t be accomplished through text alone. 10. The number of businesses using video on landing pages jumped from 49% last year to 60% this year. Why it’s relevant: More people are using video on their landing pages (in fact, it’s shown to increase conversions by 80%). That means it’s worth trying on your prospects too! 11. The number of businesses using video in email jumped from 36% to 46%. Why it’s relevant: With more functionality built into tools that can send video via email, more businesses are able to incorporate it into their marketing. This may be a way you want to test click rates and engagement on emails. At IMPACT, we’ve been testing this using Vidyard. 12. Video use in sales conversations has also experienced a marked increase from 25% to 37%. Why it’s relevant: Video isn’t just for the marketing department, it can be useful in creating trust amongst prospects and your sales team too. 13. Product videos, demos, and explainers are the most common videos produced; websites and social media are the most common distribution channels. Why it’s relevant: These types of videos are usually the first on the list for companies that have a product - which is important, but this article includes some other types of videos that are gaining more traction. 14. 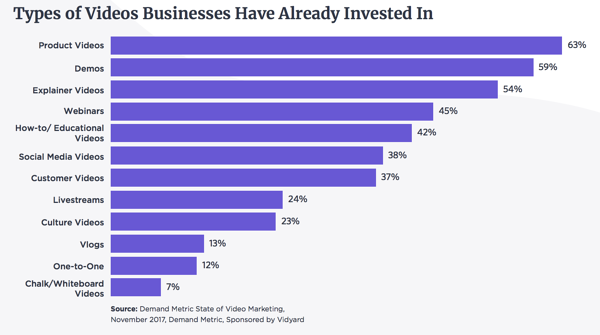 Types of videos businesses have already invested in: 59% demos, and only 12% one-to-one, 7% chalk/whiteboard videos. Why it’s relevant: Proving stat number 13 further, there is a huge opportunity to differentiate yourself and produce the one-to-one (personalized videos sent directly to one person) and chalk/whiteboard videos for your business/industry. Why it’s relevant: Website and social media are most likely where visitors/prospects are expecting to see video content - so make sure you’re there. But also consider how you can differentiate yourself. 16. Over two-thirds of study participants indicated that it is important for the sales team to have access to customer and prospect video viewing data and 61% of sales teams are already using these analytics to qualify, engage, or influence deals. Why it’s relevant: Other companies are seeing the advantage that video statistics on users can have in the sales process, so it’s important to plan a way to share this with the team. 17. The average portion of viewers remaining by the end of a video is 46%, with video length playing a big role in retention. Why it’s relevant: Shorter videos have a higher completion rate than longer videos - because we’re all so busy and need short bits of information rather than extremely long, detailed content. 18. Videos less than 90 seconds in length see an average retention rate of 59%, as compared to videos over 30 minutes that retain only 14% of viewers. Why it’s relevant: The question for videos over 30 minutes - what is the real purpose? Have you lost the original point of creating the video, and has the user lost interest because you’ve strayed from that point? 19. Those using advanced video analytics were twice as likely to report that the returns on their video investments are improving. Why it’s relevant: With advanced video analytics, you can find out how people react to your video content to make better content, or share the information with your sales team to fuel their conversations. 20. The use of video analytics is becoming more prevalent, with 36% of businesses using intermediate or advanced analytics to measure performance and only 13% of businesses not using video analytics of any kind. Why it’s relevant: Everything we do in marketing should have a way to be measured! Find out what will make the most sense for you and your team to be able to measure, and find the solution that will work best for your situation. 21. 89% of views of business-related videos take place on desktop browsers, with only 11% on mobile devices. Mobile views of B2B content actually decreased by 3% as compared to last year’s data! Why it’s relevant: This is probably the most surprising statistic. Of course, all content should be mobile optimized - always - but this stat paired with the large number of demo or product videos could have something to do with a large percentage of desktop views. If the video is focused on a screen or displaying a graphic to explain something, someone is more likely to view it on a bigger screen (their desktop). 22. Chrome remains the top browser when consuming video content, with Internet Explorer still holding its own in second (though usage has fallen dramatically from last year’s 34%). Why it’s relevant: If you’re in a particularly ‘techy’ industry, you know we all have the same feelings about older versions of Internet Explorer - but we still have to be aware of what the data is telling us. It is essential to ensure the platform your video is hosted on, and the page your video is living on are optimized for all browser types - or else you’ll risk giving someone a poor experience. 23. The middle of the week is the most popular for B2B video views, with Tuesday between 7AM-11AM PST (10AM1PM EST) seeing the highest number of views. Why it’s relevant: This seems oddly similar to the 2013-ish stat of ‘Emails are best sent on Tuesdays at 10am’ - but take it for what it is… guidance on testing out publishing and promotion dates/times for your users. 24. The average length of a video is 9 minutes, but 75% of all videos published in the last year are less than 2 minutes long. Why it’s relevant: It’s important to produce content that’s purposeful and helpful first - but if you have content that can be longer, it’s worth testing out the success to see how your users will interact with it. Why it’s relevant: Facebook can be a platform to publish your videos on - but make sure that it’s visually interesting enough that someone would want to continue watching without their sound on (i.e. with an eye-catching thumbnail) and that you can use captions to ensure your message is still received. Let these stats fuel a conversation with your entire team (or department heads) around video in 2019 (and frankly, the rest of 2018). If you’re starting from the ground up, take what you can here to prove that video WILL work for your organization, and learn from what others have tried. This video marketing webinar Marcus Sheridan and Zach Basner from our team recently recorded may get you jump-started. If you’ve been doing video marketing but it’s time to rethink your strategy, make sure you’re keeping up to date on user habits and trends - just because something worked last year doesn’t mean it’s still relevant.